I wish I could tell you that there was a special wax just for white cars that made that white paint paint really pop. Unfortunately that’s not the case regardless of what some manufacturers and review sites claim. Why do these sites advertise special white paint waxes then? They know people want the best products for their specific car and will be more likely to buy a product that’s advertised as specifically for their color paint. All hope is lost though. This is actually good news for you because it opens up your options to use things such my favorite wax, Collinite 845. Many waxes advertised as being specifically for white either contain very mild abrasives and solvents to try and smooth out your clear coat’s defects or are just tinted to attempt hide scratches. Neither of these will perform well enough to do much justice on white. The truth is for white paint to look its best, regardless of wax or sealant used, it needs to be perfectly clean and smooth. This includes decontaminating the clear coat it with something like Iron X and then clay baring and polishing it to make it as pure and smooth as possible. Don’t believe me? To the here a picture of a car where the left panel was cleaned, clay-bared, decontaminated, and machine polished. The right panel has only been washed and clay-bared. See how much brighter, whiter, and glossy the left panel is? This is especially true on a new car where the paint has picked up rail dust, industrial fallout, and many other sorts of darkening contaminants during transportation from the factory to the dealer. Once you’ve sufficiently cleaned and smoothed your paint you just need to look for a wax that is very durable and won’t darken your paint. You’ll find recommendations for these below. Almost every modern car produced today is covered in a two or three part paint consisting of at least a base coat (the color coat) and top coat that’s clear (the clear coat). 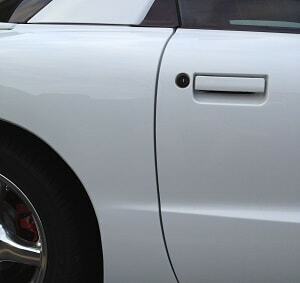 That clear coat separates any product you apply to your car from the actual color of your car. The clear coat is what gives your car’s white paint that shiny wet look. Covering it in a tinted white coating will not make your car look whiter or shinier, in fact it can actually do the opposite and filter the true brightness of your paint. The base coat underneath is what contains the white pigment and is already as bright and brilliant as it can be. We want to allow this to shine through, not filter it out. It would be like having a wooden table with a glass top and expecting to wood to look better by waxing the glass with brown wax. Never thought about that huh? Another fact about white that most people don’t realize is that no white paint is truly white. Every white paint has a very small tint of other colors such as blue. A true, untinted white base is actually very stark to look at and most would not find it appealing. This further illustrates why you cannot expect a generic white filter over the top to bring out your white paint’s natural brilliance. On top of that, the thickness of a layer of properly applied wax or sealant is so small that unless it’s a dramatically different color from white (like red or black), it’s not likely to produce a visible shift in the color of the paint. The only benefit you may receive from a white wax would be filing in very minor and superficial scratches. This still wont help much because any scratches that are bad enough to detract from the appearance of your white paint will not hide well with a tinted wax. White is a very forgiving color and scratches bad enough to shift the appearance will require more than a wax can provide. To truly bring out the brightness and reflectance in a white car you need ensure the clear coat is free of defects, scratches, dirt, and contaminates. That will require washing it, decontaminating it, polishing it to remove scratches if there are any, and protecting it from oxidation with a wax or sealant that won’t alter the color. You will then pick out a wax that will properly seal in that perfect finish. That should be your goal in picking out a wax for your white car. Not all waxes marketed for white cars are tinted. Some are marketed for white cars because they contain solvents and abrasives that help restore neglected clear coat to bring out the brilliance of the color underneath the clear. Another name for these (when not marketed to white car owners) is cleaner waxes. On their own these are great waxes. What you need to know is that these products remove a minute amount of clear coat in order to provide the results you’re looking for. Your car has a limited amount of clear coat so you really only want to use these products if necessary. If your paint is perfect already you should be looking for a finish wax or sealant (one that doesn’t advertise as a cleaner wax or as having abrasives or solvents). Finally, some white paint specific waxes are marketed as such because they don’t contain any pigments to change the color of your paint. Again, this isn’t an issue unless there is stark difference in the color of the wax or sealant. Most waxes, unless advertised for dark colors, are of colors that won’t affect how white your paint looks to you once it’s properly applied. If you go the sealant or coating route, many sealants and coating are actually clear. There is another nail in the marketing coffin for sticking with special white paint waxes. What are the Real Types of Wax Owners Should Consider for White Cars? The real question you should be asking yourself is what type of wax should you buy for your white car to lock properly protect your clear coat and keep it… well… clear and smooth! Waxes come in a couple different types and several different categories. You can learn more in my Ultimate Guide to Car Wax. In short there are two main types of automotive wax: cleaner wax and finishing wax. Cleaner waxes as stated above have abrasives and solvents that attempt to restore the appearance of your clear coat (at the cost of clear coat). Finishing waxes do not have abrasives and solvents and are purely for protection of your clear coat. Most sealants do not contain cleaners either and are purely for protection. Buy a cleaner wax if your clear coat is in less than perfect condition and you don’t feel like polishing it. Buy a finish wax or sealant if your paint is in great shape already. Beneath these two types of waxes are categories of spray, liquid, and paste wax. The use of these is purely preferential. Some people like using paste over liquid and vice versa. Liquid waxes are a little easier to apply in that they require less force to remove from the container and spread easier. Unfortunately, they are also easier to apply too much of making a harder job of buffing of the excess. Buy what you like using so you’ll continue to use it. So then, what would I recommend for a owner of a white car looking to keep their paint protected and pure? I love this stuff. 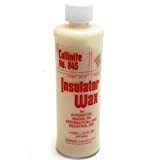 Collinite 845 is a very durable wax. Remember, when it comes to white you want to focus on protection. Different waxes and sealants don’t affect the brightness of the paint as much you want desperately to believe. You want something easy to apply, easy to remove, easy to smell, and long lasting. This wax ticks off all of those boxes. It also does a fabulous job at keeping bugs, tar, and road film from sticking to the paint. Considering this wax was developed to help protect electrical insulators and boat hulls I’m confident it can handle your white paint. On top of all that, being a liquid wax with some weight and body to it, you can easily apply it by either hand or machine. I routinely apply this wax using my Griots Garage 6″ dual action polisher with a foam pad and remove it with a soft microfiber towel. This wax also has great shelf life and value over time. I’ve been working on the same bottle for two years now and it works as good today as the day I bought it. Since it goes on thin you don’t use much during each waxing session. The only real and fair drawback to this wax is that it can stain raw black plastic, trim, and rubber so you have to be careful when you apply it. On the bright side (no pun intended), it won’t hurt plastics such as your headlight and taillight lenses. In fact, I recommend using it on the lenses on your car to help protect them from oxidation, bug guts, and other contaminants. For waxes, this stuff is hard to beat. I’ve really only found sealants and ceramic coatings to last longer. If you’re not comfortable with sealants and coatings yet then you can’t go wrong here on a white car. All in all it’s my pick for the best wax for a white car for the money. 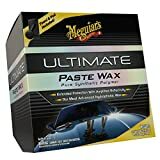 I’ve used many different kinds of boutique paste waxes and sealants from Pinnacle and Wolfgang to BlackFire and Zaino and I still come back to Meguiars for the best bang for the buck. While technically more of a sealant than a wax due to being synthetic, Meguiar’s Ultimate Paste Wax is an excellent option for owners of vehicles with white paint that’s in good condition. It’s not loaded with abrasives or solvents like a cleaner wax would be. It’s synthetic meaning it will bond to your paint better and will last much longer than a traditional carnauba paste wax. My personal opinion is that it looks just a great as any carnauba on a white car. This wax goes on clear so it won’t negatively jack with the optical properties of your car’s paint. It doesn’t stain plastic or black trim either. You can apply it in sunlight if need be, though I still recommend applying it in the shade when the surface of your paint is cool to the touch (as does Meguiars). It’s also resistant to heat so it will hold up in areas where high temperatures and searing sun are common. The wax is also easy to remove. I’ve not had trouble buffing this wax off to a clear finish free of smears or streaks when I give it sufficient time to bond before removing. To top it all off it’s incredibly affordable compared to other high end waxes such as those by Pinacle and the likes. The thing to consider with the paste wax is it would be harder to use by machine if you think might ever buy or use an orbital buffer for application. On the flip side it has been my experience that it’s a bit easier to remove or buff off the paint than the liquid variation of the same name. It really just comes down to personal preference. If you prefer the feel of using a paste wax, this will do everything you need it to do for your white car. 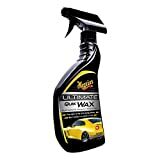 Meguiar’s Ultimate Quik Wax is a great option as both a stand alone wax and a maintenance wax to be used after washing to boost your original wax application. It’s compatible with both the liquid and paste versions of Ultimate Wax. The only real problem with this product is it’s not easy to apply by machine. If you don’t plan to purchase or own an orbital buffer then you don’t have much to worry about. Just as the previous two recommendations, this is not a cleaner wax and does not contain any abrasives or solvents. It will not help cover up anything more than extremely superficial scratches. If you’re looking for a wax to be bring back neglected black paint without resorting to compounding and polishing then check out my below recommendation. If you’re looking for the best spray wax for a black car for the money then this is your ticket. Technically a sealant and not a wax, Blackfire Total Polish & Seal is a great 1 step product for leveling the scratches and oxidation in neglected white paint. It’s best used by machine but can be used by hand to full affect as well. This is a product you would use if your paint wasn’t in perfect shape but you weren’t will to spend the money, time, and effort to do a full on compound and polish paint correction. It’s one of the stronger all in one paint correcting products on the market. Due to the lower longevity I would suggest using this for the first waxing session of your paint and then following subsequent sessions up with a longer lasting finishing wax such the Collinite recommended above. There really is no “best wax for white cars.” It’s really just a matter of the finding the best wax to protect the hard work you have put into making your white paint as clean and pure as possible. Since white is so forgiving you don’t have to obsess over wax types, colors, or compositions. You just need to pick one that’s neutral in color, long lasting, and incredibly hydrophobic. In my book that wax is Collinite 845. If you absolutely must have a paste or spray wax the Ultimate line of Meguiar’s waxes are great options as well but I still recommend Collinite 845. I use it religiously have yet to find anything that makes me want to switch. Don’t spend too much time trying to find the absolute best if you’re not already using something. Your paint needs protection now. Seriously. Buy the Collinite 845 and get that peace of mind. You can sweat the details later, provided you have any desire left to (I don’t believe you will). Dude. There was no need to waste that much water to show Collinite beading in your video. It was really disappointing to see water getting wasted. I appreciate your concern but that’s not me in the video. That’s merely a video I shared from YouTube that did a good job demonstrating Collinite’s performance. I can assure you I would never waste that much water. I pay for my water (and subsequently sewer based on water usage) and it’s not cheap. In fact, I do a great deal of my washes as waterless or rinseless washes. Not for the water savings, though, but for how much faster they are than the two or three bucket method when the cars aren’t absolutely filthy. Plus, I can do a waterless wash in my garage on my WS6 so I don’t have to worry about water spots from the sun and I don’t get water lodged in places it doesn’t need be and thus avoid rust.